This video demonstrates the 1080p surveillance video that the HD-BX7 box HD-SDI CCTV camera is capable of. There are three video clips show using the following camera lens settings: 2.8mm, 5mm, and 50mm. In this video we will review 3 surveillance video clips recorded using the HD-BX7 HD-SDI security camera from CCTV Camera Pros. The 3 videos were captured using the following lens settings: 2.8mm indoors to show the widest view available. and 50mm outdoors to show the most narrow and zoomed in setting on the 5-50mm lens option. Lets take a look at the 2.8mm video first. The area in this warehouse is 25 feet wide by 36 feet deep. Using the widest setting on the 2.8-12mm lens. the camera does an excellent job of capturing this entire room. Next we use the HD-BX7 with a 5-50mm varifocal lens outdoors with the lens set 5mm. The garbage dumpster in the background in located 100 feet away from where the camera is mounted. Mike is going to walk that distance and stop about 12 feet in front of the camera. Next we will use the same 5-50mm lens with the camera mounted in the same spot, but we have adjuested the lens a little short of the 50mm setting to get a zoomed in picture of the grabage dumpster. Again, this dumpster is located 100 feet away from the camera and you can clearly read the letters on the sign. The 5-50mm lens option gives installers a lot of flexibility to adjust the camera's angle of view on distant areas to monitor. The HD-BX7 is available in two different models which come with different lens sizes. The HD-BX7-28 comes with e 2 megapixel 2.8-12mm varifocal lens. The HD-BX7-5 comes with a 2 megpixel 5-50mm varifocal lens. This camera can be for indoor or outdoor video surveillance applications using one of the two different mount options that are available. The indoor bracket allows installers to mount this camera to any ceiling or wall. 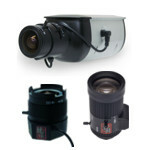 The weatherproof housing and bracket allows installers to use this camera in outdoor surveillance applications and the optional heater and blower housing can be used in extreme hot or cold climates. The following video surveillance equipment was featured and used in this video. HD-BX7 with 2.8-12mm and 5-50mm lens options.